…..news letter #583 – i got shorts, all colors…..
well, i’m not gonna lie, i’m swamped with received record store day stuff, and all the stuff that is available now, so i won’t bore you…. read on! this is your last reminder, next saturday, april 20th is RECORD STORE DAY! we are already busy receiving all kinds of cool releases for you to attempt to acquire next weekend. remember, we open at 10 that morning. it’s gonna be a blast. – irdial announces the release of the conet project: recordings of shortwave numbers stations, tcp/1111″: special 5cd edition. this will be a limited edition shrink-wrapped package containing: 1. the original 4 conet project cds in their own quadruple jewel case. 2. three black-and-white postcards. 3. one full-color postcard. 4. the extended 80-page booklet in its own jewel-case. 5. the new 5th cd in its own jewel case with its own new full-color booklet. the conet project is one of the most influential and important collections of recordings ever released to the public. its original release in 1997 was unprecedented and completely unexpected. no one had heard of “numbers stations” before the conet project, and its release baffled everyone who heard it. but it struck a chord. 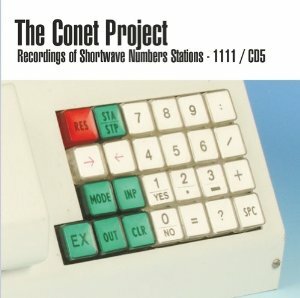 the unique sonic qualities and astonishing variety of the conet project’s recordings, combined with the clandestine origin of numbers stations and the meticulous research in the accompanying booklet combined to form a release that resonated strongly with people from a wide variety of backgrounds. now 15 years later, irdial-discs is re-releasing this ground-breaking and legendary work in a new updated edition, featuring a fifth disc containing a set of 26 carefully selected examples of shortwave “noise stations” sourced from the private tape archive of akin fernandez, the conet project’s creator. if shortwave radio transmissions were nested like a matroska, the outermost doll would comprise the ordinary government-licensed broadcasts that transmit propaganda and music. next down would be the licensed hams and utility stations used by shipping, weather and hobbyists. then come the numbers stations; the unlicensed and unacknowledged communications from government agencies to spies in the field. innermost of all of these are the completely abstract “noise stations” that have no point of human reference, other than that they can be heard. these noise stations sometimes consist of irregular and rare data-modes, and as such can be put into a context, but in other instances, noise stations have no plausible explanation at all. some are clearly being transmitted because there is a carrier wave and are not natural earth or space noises, but the content of the signal is without any obvious utility. for example, we present a recording that consists only of a loosely rhythmic “clacking” sound, that is similar to a man playing claves. when live on air, this broadcast went on for hours without interruption, only to suddenly cease without any discernible message of any kind. another example is track no. 2, for which we have no explanation. it was only heard once, went on without interruption for at least three days, and then disappeared. it appears to be a highly complex encrypted data mode of some kind, but is unlike any sound normally associated with data modes. a true mystery. as is the case with numbers stations, it is very unlikely that some of the more odd noise station examples on disc five of the conet project will ever have a good explanation provided to the public. this is to be expected. after 15 years, the numbers station mystery has barely unraveled, save for some isolated glimpses into the mechanics of their operation. irdial is privileged to be able to present one such rare and extraordinary revelation with “tcp/1111” which can be seen in the booklet of disc five. irdial has obtained photographs of an actual numbers station voice machine, as was used in many of the former communist block countries. this event is without precedent. somehow, a german man managed to buy a set of these voice generators, and irdial has obtained photographs from him of the outside and inside of one of these machines. this machine’s function is to play sampled voices under the control of a 7-bit asciiI punched paper tape. it is made of widely-available commodity electronic components, and the manufacturer’s name does not appear on the casing; only two serial numbers “3 2620” and “nr.8515” and a handwritten “x1.85” appear on the back of an access panel, with english lettering indicating the rear connector functions. the emergence of this machine raises many questions. who designed and manufactured it? who sold it? why were these machines not destroyed after the decommissioning of the stations? and of course, this is only a tiny fraction of the larger picture. numbers stations and noise stations are a problem and a phenomenon that is ongoing, and that will continue to perplex and fascinate listeners and the curious for decades to come. – the fourth album by the besnard lakes features heavyweight additions by moonface’s spencer krug and mike bigelow, the barr brothers’ sarah page, the always enchanting monica guenter and the return of the fifth string liberation singers’ choir. the story of the album unfolds its introspection on the endurance of the human spirit during prophetic times as told by a spy or two, maybe more. each of the eight tracks on the album takes off, coasts, and lands smoothly, with a jubilant slowburn of its own momentum for the benefit of the larger picture. the besnard lakes create a distinct and dreamy headspace, an enigmatic and somehow familiar placelessness. – first ever reissue of this rare & obscure french private press lp from 1976. more of a one-off happening then an actual band, the album resulted from the one & only meeting of the group for a single overnight champagne-fueled session. as unlikely as it seems, somebody thought to roll some tape, and a very special evening was captured & pressed to vinyl… opening with a gorgeous drifting instrumental, and centered around three long jaw-dropping acidfolk originals, the album is filled out by wild romps though traditional folk songs. all english lyrics, female backing vocal, two acoustic guitars, dulcimer, autoharp, banjo, and some especially beautiful snaky flute work. the original compositions are truly magical : gently flowing and beautifully pastoral, but with an eerie, druggy, edginess. think ‘book of am’ minus the sunshine & electricity and you’ll be in the right zone… the trad folk cuts on the other hand are nearly as cool : joyous, dirty, and totally ragged music by & for the people. no ‘folk boom’ pretense on display, just ageless tunes, fast pickin’ and wild drunken wooziness, like some sort of reckless gypsy hoe-down… everything here is totally steeped in a damp, pagan / mystical basement atmosphere, that combined with the raw direct-to-tape, no overdubs / mixing execution & perfectly crude, haunting cover art make for a very distinct whole… originally only a few hundred copies of the lp were pressed up, and as there was no actual band to promote, those gradually slipped away into total obscurity. edition of 350 copies. – demdike stare return to the lab with two extended new productions, inaugurating a series of untamed releases brought together under the testpressing banner. “collision” was recorded in late 2012 and is an intense high-frequency re-arrangement of jungle and noise, fed through a bank of analog boxes and pedals, left to spin uncontrollably for 10 minutes before fading to black. “misappropriation” feeds off a different noise altogether, perched precariously between the mangled percussion you’d most commonly associate with muslimgauze and the metallic clank of industry. – deluxe reissue of this totally unknown new england teenage folk private press from 1971. originally released by the artist herself as a demo only blank cover edition of 100 copies. just out of high school and hoping somebody might pay attention, the lp slipped though the cracks, the chapter closed, and life moved forward on a different coarse… but the album left behind stands as a true female loner folk gem, of which there aren’t many at all… just ellie’s humbly intimate vocals & her harp-like self taught finger-picked guitar playing, plus some lovely pastoral flute by a friend on a handful of tracks. the sounds are straight from the tuned-in melancholy teenage mind, reeling from the mind expansion of the 60s, but also the excesses. deeply reflective, poetic & searching lyrics of love / nature / peace playing out in real time against stark reality / longing / loss, and balanced at the very edge of the void. the aching innocence of youth tempered by a biting contempt for all things false… in the liner notes ellie mentions only practicing under a blanket, and there’s a up-close, lo-fi, almost voyeuristic realism / fragility here that’s quite special. a complex & personal trip that takes some time & attention to fully unfold. once it does, it will be no surprise that ellie went on to build geodesic domes & become a professional midwife, as that same unique spirit is already deeply embedded here… a really wonderful album we’re happy to help finally reach some receptive ears…edition of 300 copies, in two cover color / texture variations (black & burgundy). – first-ever reissue of this uk private press masterpiece from 1972. everyone involved was a hippie collective formed by well-trained musicians, assembled by alan wakeman and michael klein (solid british hat band) to record a set of environmental protest songs. some of the members of this london-based recording commune included vocalist freya hogue (ex-sunforest), guitar player lucinha turnbull (later with cilibrinas do eden/rita lee), and bass player arnaldo “liminha” filho (os mutantes) among others. either/or is a perfectly played and professionally recorded album (something very unusual for a private pressing). top-notch psychedelic folk-rock/acid-folk with male-female vocals, flute, electric-acoustic guitars, bass, drums and some freaky/weird arrangements/effects. the album is now also famous for including “a gay song,” which is probably the earliest known example of a pro-open gay song. the original pressing of 1,000 copies was never distributed or sold at stores, all the copies were given away for free (even to people passing on the street!). one of the members even buried a large number of them in a time capsule in the amazon rainforest. needless to say, the original album has been a highly sought-after artifact since the early days of obscure psych-prog record-collecting. this reissue reproduces the original embossed cover and includes repros of the two rare inserts, including the giant fold-out poster with new liner notes and info printed in the reverse. also included is a repro of the save piccadilly 7″ single released in 1972, featuring a non-album track: “the circus keeps on turning.” remastered sound from the original master tapes. limited release of 500 copies only. – “the sounds of classic 36 chambers-era rza meld with portishead and the italian film music of ennio morricone on 12 reasons to die, the new album from ghostface killah and adrian younge. this project is a daring, full-length crime/horror concept album. 12 reasons’ executive producer and ghostface’s longtime wu-tang clan collaborator the rza, refers to the album as ‘groundbreaking’ in the hip-hop genre. ghostface killah’s prominence in hip hop has grown steadily over his 20-plus year career — including recent high-profile appearances on kanye west’s cruel summer, rza’s the man with the iron fists soundtrack, and the new wu-block album — 12 reasons catches the gifted mc at the height of his lyrical prowess.” instrumentals version also available. – a luminous veil is the debut release by alexander lewis. six tracks of heart-sore modern industrial and s-m techno created using synth, microphone, and pedals. recorded in one take with minimal computer processing or post-production. limited edition of 500 copies only. – the definitive version of this triptych of tectonic drift originally released as a cd-r on sean mccann’s own recital label in 2011. “our silhouette,” which blankets the whole of the first side with jewel-like piano runs and distant fading synths, may be one of the artist’s most elegant moves. the reverse holds two tracks of long-form organ/string plateaus that float elegantly in space, refracting light and sound in patterns around the head. – miles has been releasing material on modern love for a decade, first as one-half of pendle coven, then on his own as mlz, and eventually pairing up with sean canty to record as demdike stare. in between he’s also pursued more experimental terrain under the suum cuique moniker, produced jungle for the hate project and (together with andy stott) taken on the occasional release as millie & andrea for modern love sub-label daphne. after more than 10 years of producing, faint hearted is his debut solo album — an exposition of miles’ love of electronic music in all its shapes, harnessing his fidgety production style into one expansive, restless set of tracks. the album opens with the filtered and looped jungle mutation of “lebensform,” through to the minimal, barely-noticeable bass-shifts of “irreligious,” the classic plastikman-infused looped ruffage of “status narcissism” and the padded bliss of “sense data,” coming across like a lost move d production from the classic studio pankow era. the second half opens with “rejoice,” a slowly-unfurling 4/4 variant that sounds like a more technofied and electric take on his work with demdike stare, while “archaic thought pattern 1” invades a sequence of strings and bass notes with blasts of white noise, sounding like something off aphex twin’s donkey rhubarb ep rebuilt by mika vainio. the set ends with the evocative field-recorded sequence “queuing” and the ambient futurism of “loran dreams,” in some respects the straightest, most affecting nine-minute stretch yet from a producer who is seemingly unable to settle or stand still. – based in greece, mohammad make long-form drone works that explore the lower end of the frequency spectrum while retaining an intense emotional capacity. the results are monumental, slow-moving blocks of sound, both daunting and musical. the sheer weight of these recordings is impressive, the interplay of the musicians and instruments staggering, this end result being an album rich with harmonious abstraction which highlights years of dedication to their unique path. som sakrifis follows the trio through three tracks of deep space experimentation where the acoustic and electronic blend together as a monumental whole. listening to som sakrifis takes the listener on an expansive journey through the netherworld of the low range while retaining distinct traces of musicality. the time and space in these works have a logic more akin to that of hungarian filmmaker déla tarrthan any contemporary music references. monumental monochromatic movement is the order of the day. sit back, strap in and let these fine explorers take you way out into the nether world. – southern californias’ nails was formed in december 2007 by todd jones (ex-terror) along with the help of taylor young (cremetorium), and john gianelli. nails is beyond brutality. filthy, vicious and raw. Imagine a cross between the good amrep bands of the nineties (helmet, hammerhead, today is the day, unsane) and cro-mags age of quarrel riffage played at breakneck speeds. – sub pop’s second best selling album after nirvana’s bleach get’s the deluxe reissue treatment in honor of its 10th anniversary! remastered w/ 15 bonus tracks including the two brand new songs, “a tattered line of string” and “turn around” you can spend all the time and money in the world trying to craft the perfect pop-music scenario, but sometimes the stars have to align all by themselves. – kurt is slowly, quietly becoming one of the great american guitarists and songwriters of our time. this 69- minute double album is comprised of sweeping, expansive songs that are both very intimate and conversational. “wakin’ on a pretty daze” is a timeless record that would have sounded great 30 years ago, sounds great today, and will still sound great 30 years from now. beautifully produced by john agnello, the record is filled with hazy, swooning guitar lines and dreamy, beatific, and occasionally sardonic vocals. it is summed up by the staggeringly gorgeous 9-minute opener, “wakin on a pretty day”. the song is also the first video, directed by jonathan demme in the spirit of his landmark springsteen video “streets of philadelphia.” the record has other connections to kurt’s home town. steve powers (espo), the renowned philly street artist, painted the cover mural on an abandoned building near the northern liberties. the mural will be recreated in london, los angeles and new york. “kurt vile distills thousands of hours spent with classic american guitar music into one very singular and sublime vision.” – pitchfork. – mystiphonic is the third release from roland p. young on em records, following isophonic boogie woogie which was originally released in 1980 and re-issued by em in 2005, and the 2009 istet serenade. mystiphonic is the fruit of two years of recordings at young’s isophonic sound laboratory in brooklyn, “comprovisations” which are more electronic than the previous em releases, and yet this new cd retains young’s emotional life-long horn playing, a romance which began in his youth in kansas city. also carrying on from previous releases is the all-encompassing warmth and organic/oceanic feeling of young’s music, a rootedness that has been present since his early exposure to charlie parker, on through his san francisco years and ever forward, linking past, present and future through deep american soil to his world-embracing current music, all united through his “isophonic” philosophy. the mystiphonic blend of electronics, percussion and horns is one of subtle beauty, sure to please young’s fans while attracting new admirers. – “soul jazz records’ deutsche elektronische musik 2 is their second voyage into the world of krautrock and german electronic music from the 1970s and early 1980s. this double cd pack (with over two and a half hours of amazing music) features a stunning line-up of seminal german groups (can, faust, popul vuh, neu!, cluster, amon duul ii, la dusseldorf) as well as lesser known and more obscure groups and artists such as agitation free, broselmachine, niagara, and many more. the double cd pack comes in unique box-edition with large booklet and excellent extensive new sleevenotes (by david stubbs, author of the excellent krautrock book published by black dog) as well as lots of exclusive photos.” other artists include: a.r & machines, michael rother, popol vuh, agitation free, d.a.f., harald grosskopf, gila, you, and asmus tietchens.